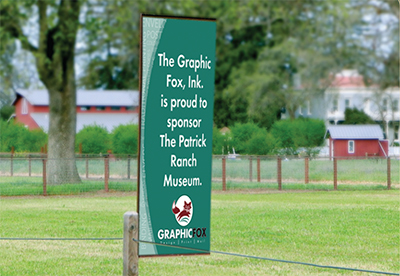 For a single donation, Patrick Ranch Museum will create a 2’ x 6’ sponsor banner that will be installed along the perimeter of the museum during EVERY Patrick Ranch sponsored event during the year. Annually, visitors surpassing seven thousand in number, attend a variety of events from weekend programs and the Country Faire and Threshing Bee, to classroom opportunities, the AutumnFest, Fiber Fusion, stock dog trials, Snow Goose Festival support activities and holiday events. Sponsor banners will be on display for 90 plus days per year. Includes the creation of a 2' x 6', one sided vertical banner that will be displayed along the driveway or on the Midway, in addition to your business name listed in our event brochure and event media advertisements. Banner will be rotated along the perimeter with each subsequent event throughout the year. Sponsorship includes four (4) Country Faire and Threshing Bee passes. Includes the creation of a 2' x 6', two sided vertical banner that will be displayed along the driveway or on the Midway, in addition to your business name listed in our event brochure and event media advertisements. Banner will be rotated along the perimeter with each subsequent event throughout the year. Sponsorship includes eight (8) Country Faire and Threshing Bee passes. Includes the creation of a 2' x 6' two sided vertical banner that will be displayed along the driveway or on the Midway. In order of request and sponsorship confirmation, donors in the “Platinum” category will have the opportunity to designate banner placement along the driveway or along Midway. Your business name will also be listed in our event brochure and in event media advertisements. Platinum sponsorship also includes twelve (12) Country Faire and Threshing Bee passes. We would welcome the opportunity to give each of you a guided tour of our facility, to meet you at your business location and to answer any questions. Sponsor checks should be made payable to Patrick Ranch Museum with a notation that it is for sponsorship of the Country Faire and Threshing Bee. 10381 Midway, Durham, CA 95938. Please include a "camera ready" image of your business logo to be used on your customized banner. Banners will be made promptly upon receiving your donation and will be put up at the earliest subsequent Patrick Ranch Museum event.